Accounting & Tax Professionals, PLC offers a full range of personal and business tax and financial services, from tax preparation and tax resolution to small business accounting and payroll services. 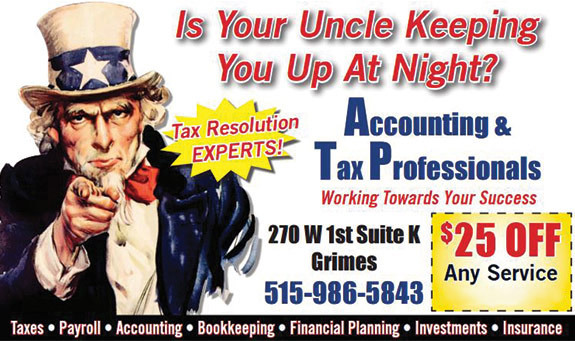 We are proud to be Grimes, Iowa’s premier tax professionals, and love serving our neighbors. Tax season comes around every year, but for many people, it never feels like there’s enough time to get everything in order. If you’ve struggled to file your taxes on time or are worried about how a life event may impact your taxes, it may be time to enlist the services of a professional for tax assistance in Des Moines, IA. Accounting & Tax Professionals, PLC has served Grimes and the surrounding areas since 1997 with the finest tax services around, assisting individuals, families and small businesses with the process of preparing and filing tax returns and dealing with a variety of complex tax problems. We have been a locally owned and operated tax service since 1997. Our services are available to individuals, families and small businesses. We have two enrolled agents on our staff to assist with your tax issues. We are members of the Grimes Chamber of Commerce, the National Association of Tax Practitioners and the National Association of Enrolled Agents.. Contact Accounting & Tax Professionals, PLC to learn more about how we can assist you with your taxes and other financial matters. For Increasing Profits in a Recession Recovery"